CHICAGO (Feb. 8, 2019) - Automakers, manufacturers and enthusiasts from across the globe are revving up for the 2019 Chicago Auto Show. 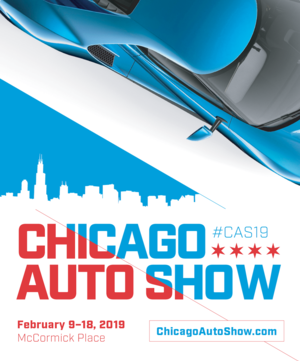 The nation's largest and best-attended auto show, held annually at McCormick Place, opens its doors to the public on Saturday, Feb. 9 and runs through Monday, Feb. 18, Presidents Day. This year marks the 111th edition of the nation's longest-running auto show. A Safe Haven Food Drive: Wednesday, Feb. 13 - Friday, Feb. 15. Show patrons who bring three cans of food will receive a coupon for a $7 adult admission. All food will be donated to A Safe Haven Foundation.